I really like eggplant and am thinking about writing a book something along the lines of '101 things to do with an eggplant' or 'Have your way with me' from the eggplant diaries. There are soooo many things you can make with this wonderful vegetable from a simple salad mixed in with garlic yogurt to making meatballs to wrapping delicate morsels up in grilled slices. Eggplant sellers at the local bazaars are out in full force too, yelling and screaming out the benifits of thier wares. Last time we went to the bazaar I bought a kilo and decided to make this very easy and very impressive looking dish. This dish has eggplant slices, tomato slices and meatballs lined up alternatively in your baking tray and for that reason looks great served up for a special dinner. First make the meatballs by taking the minced meat, breadcrumbs, salt and pepper and knead very well until it has a nice paste consistency or you could do that in your food processor if preferred. Roll the meat mixture into balls about the size of a walnut. Keep to one side. Take the eggplants and slice, I usually cut mine at about 2 fingers width, some do it a bit thicker I prefer mine a bit thinner. Do the same with the tomatoes. Now get a slice of eggplant and put into your baking tray vertically. Then take a tomato slice and do the same, then add a meatball. REPEAT until your tray if full. Add the tomato paste, 1 cup of water, mint, chilli if desired and a splash of oil into a small bowl and mix well. Pour over the eggplants in the tray . 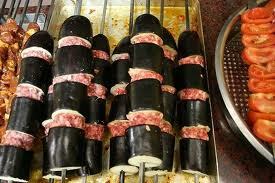 Bake in a hot oven until the eggplant and meat are cooked. This is nice served with salad, bread and ayran. You can also have this cooked on skewers and you will find this on most restaurant menus in Gaziantep. İt is also nice like that. So you would cut the eggplant slices a bit thicker and put eggplant on the skewer then a meatball and alternate. Cook over coals.